Fitzgerald in Dublin this morning. 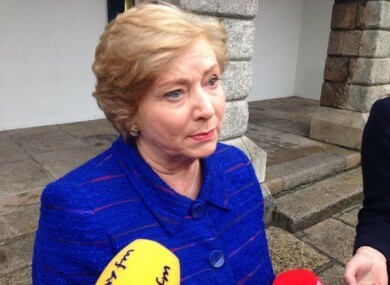 JUSTICE MINISTER FRANCES Fitzgerald has denied that gardaí were heavy-handed at the water charge protest that saw Tánaiste Joan Burton trapped in her car for almost three hours on Saturday. Fitzgerald told reporters at Dublin Castle this morning that “peaceful protest is and part and parcel of a democracy” but said the incident in Jobstown was “not part of the way we want to do business in Ireland”. She said that the vast majority of Irish people “want to see peaceful protests”. I would appeal to people that this kind of behaviour doesn’t continue. It’s not appropriate that a Tánaiste of a country is kept in a car for two and a half hours. There have been unverified reports that children were pepper sprayed at Saturday’s protest. Environment Minister Alan Kelly is said to have received a bomb threat to his office. Paul Murphy denied he was the ringleader of Saturday’s events. James Reilly said that protests have taken a “sinister” turn. Leo Varadkar said that Saturday’s events saw “behaviour of the worst kind”. Fitzgerald says that security arrangements for ministers are kept under constant review, described weekend scenes as "frightening"
She said the incident over the weekend was “frightening”, adding that there is an “ongoing review” of security for ministers. There have been unverified claims that gardaí pepper-sprayed children at Saturday’s protest with Socialist TD Paul Murphy making the claims on Today FM earlier. Fitzgerald said that guards “did not want to escalate the situation in any way” and “behaved carefully and with huge restraint”. What I’m aware of is efforts by the gardaí on an ongoing basis to manage these protests peacefully and carefully. I’ve had many reports of huge intimidation, of tyres being slashed, windscreens being broken, intimidation, efforts to move in and disrupt the work of the gardaí. Fitzgerald claimed that protesters also shook Burton’s car - this was denied by Socialist TD Ruth Coppinger on Morning Ireland earlier. Also speaking at the National Youth Council of Ireland conference at Dublin Castle this morning, Children’s Minister James Reilly said there had been some “sinister developments” in recent weeks. “I think most decent people yesterday would have felt that the line was crossed. There’s no doubt that this was very intimidatory and bullying,” he said. Earlier, Coppinger said that members of the Government cannot expect to be welcomed into working class areas after imposing years of austerity. Did she expect a red carpet when she came to the area? Coppinger said it was wrong that Burton was hit with a water balloon in the course of Saturday’s protest but added, apart from this, the demonstration was “exceptionally peaceful”. She noted that Burton, Taoiseach Enda Kenny and other members of Government would be met with anger and not “garlands of flowers” by the public. Coppinger added that she doesn’t think “anybody will be fooled” by the Government’s revised water charge proposals, due to be announced on Wednesday. “The cap will be lifted when the pressure is off,” she said, noting that she expected a “massive boycott” when water bills arrived early next year. Coppinger said that Burton should not be cast as a victim while the people of Jobstown in Tallaght, where the protest took place, were “demonised”. Yesterday Health Minister Leo Varadkar called on his Dublin West constituency colleagues Coppinger and fellow Socialist TD Higgins to “publicly dissociate themselves from the intimidation witnessed” at the protest. Varadkar said that the incident on Saturday saw “behaviour of the worst kind”. The protest was apparently organised and orchestrated by Deputy Paul Murphy of the AAA. I want to know where his party colleagues Joe Higgins and Ruth Coppinger stand on this level of intimidation. I am calling on them to dissociate themselves from the violence on display at that protest. Protest is a right in any democracy. Protest has achieved many positive changes. Intimidation achieves nothing but a culture of fear. There is no place for this sort of behaviour in a modern democracy. Higgins and Coppinger dismissed Varadkar’s comments about intimidation, describing them as being made in “his usual over the top style”. Working class communities have suffered grievously from the violence of austerity which has laid waste to jobs, forced a generation of youth out of their home country and imposed savage cuts to living standards and services. More especially there is the violence and intimidation felt now weekly by families thrown out of their homes by scandalously escalating rents and the utter failure of Varadkar, Burton et al to build social and affordable homes to meet the glaring need of the victims of the bankers’, bond holders’ and developers’ property bubble and crash. Higgins and Coppinger said that members of the Labour party “grievously betrayed” people in working class areas and could not expect to be welcomed into such communities. Labour promised to protect people from Fine Gael’s water charges and promptly stabbed them in the back by implementing same. The pair said that they would not condemn what took place on Saturday. They denied that the protest was organised by Anti-Austerity Alliance TD Paul Murphy, saying it was planned by local residents. After 6 years of savage austerity and bullying by this and the previous governments to bail out the elites of the financial markets, ordinary people are fighting back and Leo Varadkar, Joan Burton et al better listen. Email “Frances Fitzgerald: Gardaí are not heavy-handed at water protests”. Feedback on “Frances Fitzgerald: Gardaí are not heavy-handed at water protests”.